First published in May 1986/ BuZZ U.S.A. 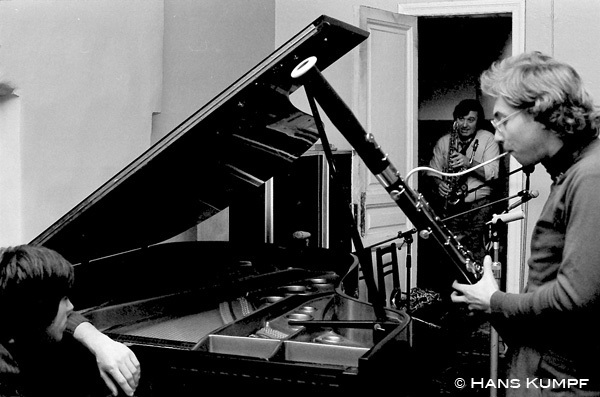 It was inevitable that journalist/photographer/improvising clarinettist Hans Kumpf and producer Leo Feigin (head of England's Leo Records) would end up collaborating on an album. 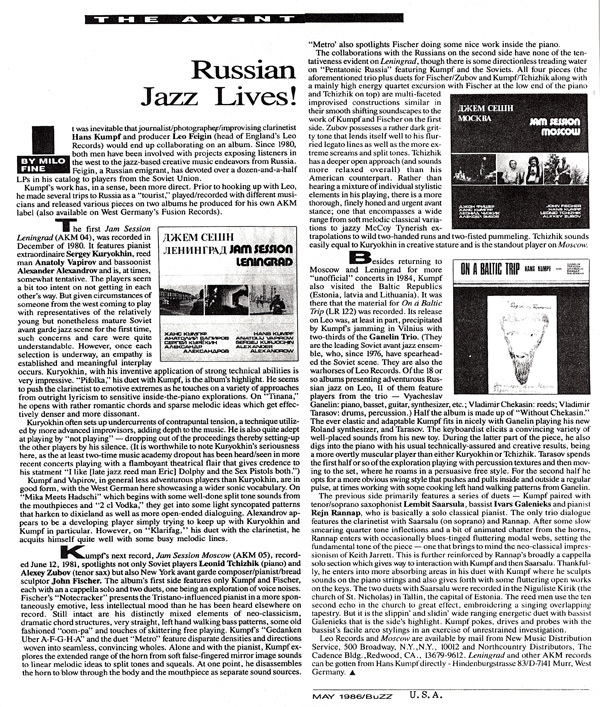 Since 1980, both men have been involved with projects exposing listeners in the west to the jazz-based creative music endeavors from Russia. 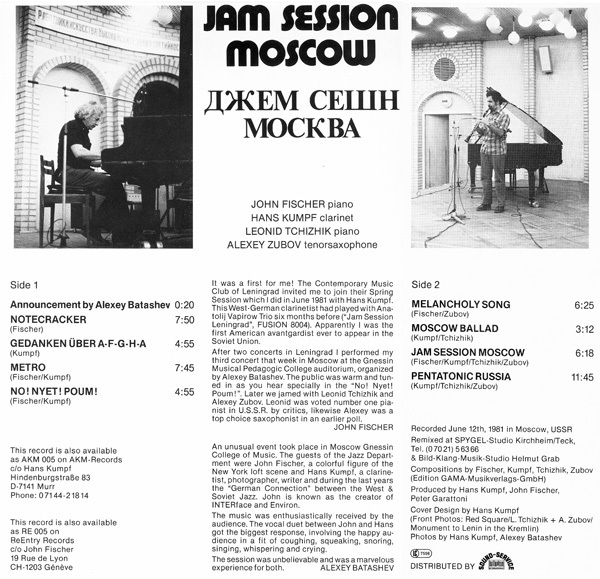 Feigin, a Russian emigrant, has devoted over a dozen-and-a-half LPs in his catalog to players from the Soviet Union. Kumpfs work has, in a sense, been more direct. 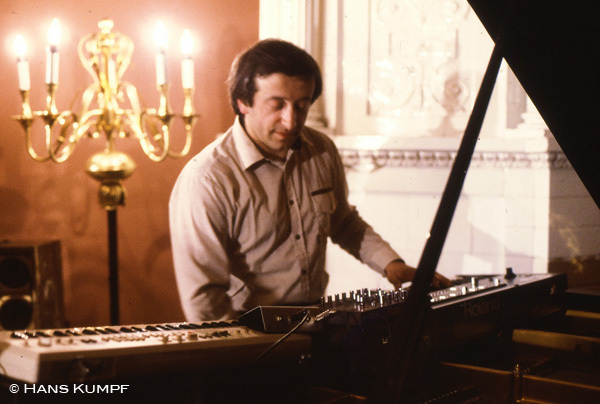 Prior to hooking up with Leo, he made several trips to Russia as a "tourist," played/recorded with different musicians and released various pieces on two albums he produced for his own AKM label (also available on West Germany's Fusion Records). 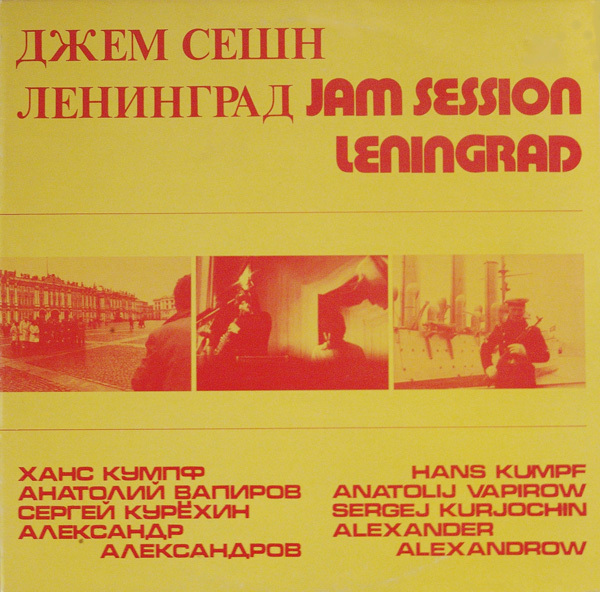 The first Jam Session Leningrad (AKM 04), was recorded in December of 1980. It features pianist extraordinaire Sergey Kuryokhin, reed man Anatoly Vapirov and bassoonist Alexander Alexandrov and is, at times, somewhat tentative. The players seem a bit too intent on not getting in each other's way. 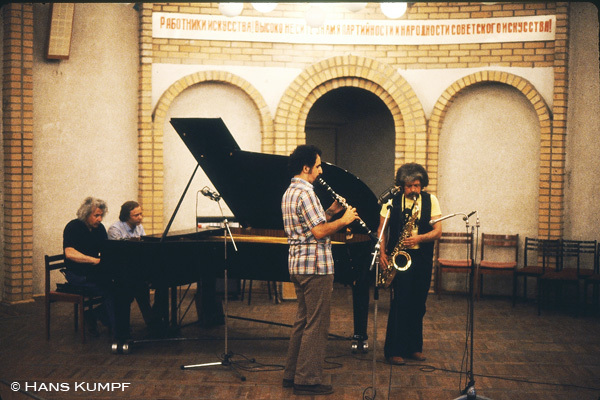 But given circumstances of someone from the west coming to play with representatives of the relatively young but nonetheless mature Soviet avant garde jazz scene for the first time, such concerns and care were quite understandable. However, once each selection is underway, an empathy is established and meaningful interplay occurs. Kuryokhin, with his inventive application of strong technical abilities is very impressive. "Pifolka," his duet with Kumpf, is the album's highlight. He seems to push the clarinetist to emotive extremes as he touches on a variety of approaches from outright lyricism to sensitive inside-the-piano explorations. On "Tinana,"he opens with rather romantic chords and sparse melodic ideas which get effectively denser and more dissonant. Sound studio of the Musorgsky Musical College, Leningrad, December 1980. Kumpf and Vapirov, in general less adventurous players than Kuryokhin, are in good form, with the West German here showcasing a wider sonic vocabulary. On “Mika Meets Hadschi” which begins with some well-done split tone sounds from the mouthpieces and “2 cl Vodka,” they get into some light syncopated patterns that harken to dixieland as well as more open-ended dialoguing. Alexandrov appears to be a developing player simply trying to keep up with Kuryokhin and Kumpf in particular. However, on "Klarifag," his duet with the clarinetist, he acquits himself quite well with some busy melodic lines. 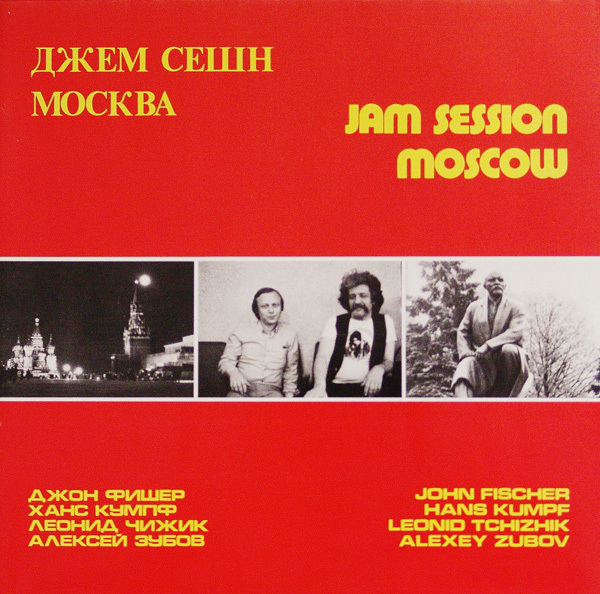 Kumpfs next record, Jam Session Moscow (AKM 05), recorded June 12, 1981, spotlights not only Soviet players Leonid Tchizhik (piano) and Alexey Zubov (tenor sax) but also New York avant garde composer/pianist/bread sculptor John Fischer. The album's first side features only Kumpf and Fischer, each with an a cappella solo and two duets, one being an exploration of voice noises. Fischer's "Notecracker" presents the Tristano-influenced pianist in a more spontaneously emotive, less intellectual mood than he has been heard elsewhere on record . Still intact are his distinctly mixed elements of neo-classicism, dramatic chord structures, very straight, left hand walking bass patterns, some old fashioned "oom-pa" and touches of skittering free playing. Kumpfs "Gedanken Uber A-F-G-H-A" and the duet “Metro” feature disparate densities and directions woven into seamless, convincing wholes. Alone and with the pianist, Kumpf explores the extended range of the horn from soft false-fingered mirror image sounds to linear melodic ideas to split tones and squeals. At one point, he disassembles the horn to blow through the body and the mouthpiece as separate sound sources. “Metro” also spotlights Fischer doing some nice work inside the piano. The collaborations with the Russians on the second side have none of the tentativeness evident on Leningrad, though there is some directionless treading water on “Pentatonic Russia” featuring Kumpf and the Soviets. 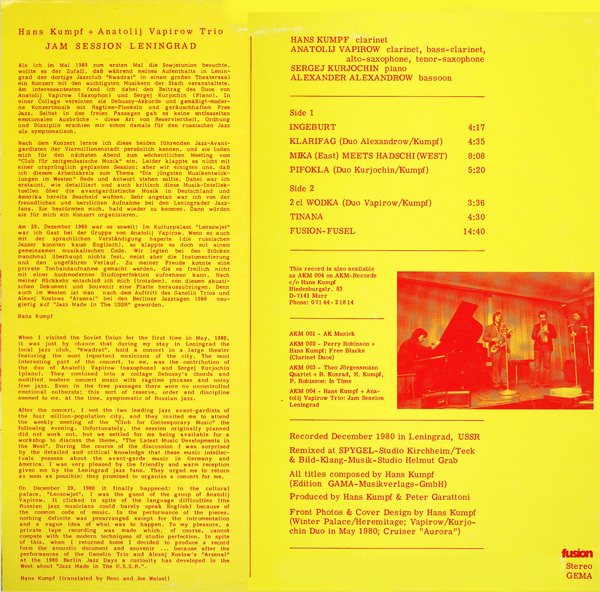 All four pieces (the aforementioned trio plus duets for Fischer/Zubov and Kumpf/Tchizhik along with a mainly high energy quartet excursion with Fischer at the low end of the piano and Tchizhik on top) are multi-faceted improvised constructions similar in their smooth shifting soundscapes to the work of Kumpfand Fischer on the first side. Zubov possesses a rather dark gritty tone that lends itself well to his flurried legato lines as well as the more extreme screarns and split tones. Tchizhik has a deeper open approach (and sounds more relaxed overall) than his American counterpart. Rather than hearing a mixture of individual stylistic elements in his playing, there is a more thorough, finely honed and urgent avant stance; one that encompasses a wide range from soft melodic classical variations to jazzy McCoy Tynerish extrapolations to wild two-handed runs and two-fisted pummeling. Tchizhik sounds easily equal to Kuryokhin in creative stature and is the standout player on Moscow. 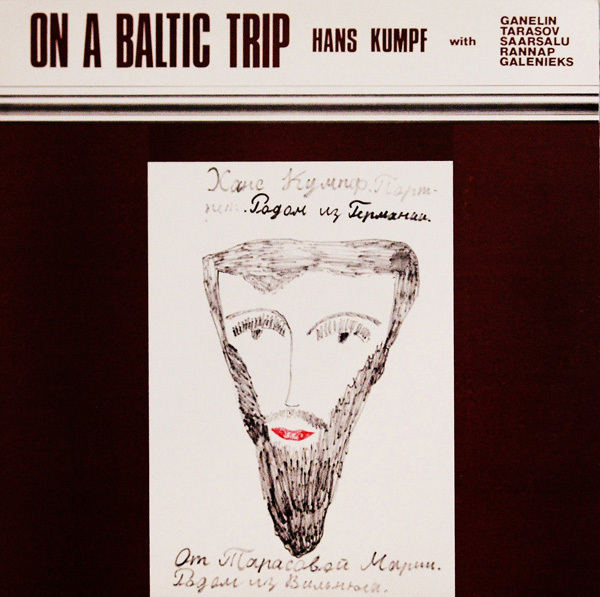 Besides returning to Moscow and Leningrad for more "unofficial" concerts in 1984, Kumpf also visited the Baltic Republics (Estonia, Latvia and Lithuania). It was there that the material for On a Baltic Trip (LR 122) was recorded. The ever elastic and adaptable Kumpf fits in nicely with Ganelin playing his new Roland synthesizer, and Tarasov. The keyboardist elicits a convincing variety of well-placed sounds from his new toy. During the latter part of the piece, he also digs into the piano with his usual technically-assured and creative results, being a more overtly muscular player than either Kuryokhin or Tchizhik. Tarasov spends the first half or so of the exploration playing with percussion textures and then moving to the set, where he roams in a persuasive free style. For the second half he opts for a more obvious swing style that pushes and pulls inside and outside a regular pulse, at times working with some cooking left hand walking patterns from Ganelin. 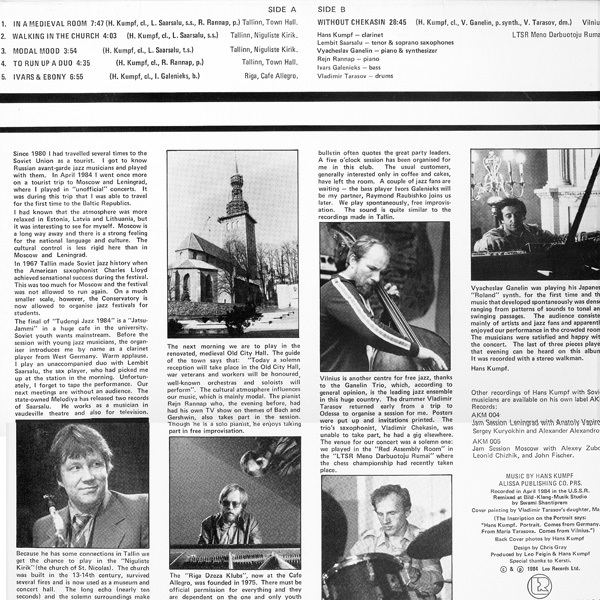 The previous side primarily features a series of duets - Kumpf paired with tenor/soprano saxophonist Lembit Saarsula, bassist Ivars Galenieks and pianist RejnRannap, who is basically a solo classical pianist. The only trio dialogue features the clarinetist with Saarsalu (on soprano) and Rannap. After some slow smearing quarter tone inflections and a bit of animated chatter from the horns, Rannap enters with occasionally blues-tinged fluttering modal webs, setting the fundamental tone of the piece - one that brings to mind the neo-classical impressionism of Keith Jarrett. This is further reinforced by Rannap's broadly a cappella solo section which gives way to interaction with Kumpf and then Saarsalu. Thankfully, he enters into more absorbing areas in his duet with Kumpf where he sculpts sounds on the piano strings and also gives forth with some fluttering open works on the keys. The two duets with Saarsalu were recorded in the Niguliste Kirik (the church of St. Nicholas) in Tallin, the capital of Estonia. The reed men use the ten second echo in the church to great effect, embroidering a singing overlapping tapestry. But it is the slippin' and slidin' wide ranging energetic duet with bassist Galenieks that is the side's highlight. Kumpf pokes, drives and probes with the bassist's facile arco stylings in an exercise of unrestrained investigation.